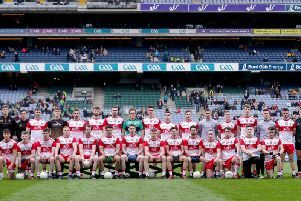 Donegal champions Mac Cumhaill’s ended Na Magha’s Ulster Junior Championship campaign before it got up and running with a deserved four point Quarter-final victory at Celtic Park on Sunday. Eamon McAuley’s men recovered from the concession of a first minute goal in an absorbing clash that was in the balance until the final moments, with captain Lee Henderson, Conor Gallgher and Gerard Gilmore the stand out performers. Na Magha, without a match in almost seven weeks, looked short of match practise and will rue some bad second half wides. A superb opening salvo of 1-02 inside two minutes should have been the platform from which to push for victory but MacCumhaill’s brought a physicality that Na Magha were unable to match. The physicality occasionally spilled into some overly robust tackles and the second half dismissal of corner forward David White for two bookable offences forced the Donegal men to dig deep but they deserved to hold on with keep Dylan Laverty making a crucial late save from Alan Grant to rubber stamp their passage to the last four. Na Magha’s blistering start threatened to blow the Donegal champions away as full forward Breandan Quigley hit 1-01 for the Derry side before 90 seconds had elapsed. A long ball in from throw in caused trouble for MacCumhaiil’s keeper, Laverty, who was put under pressure by Conor Shiels. The keeper’s weak knock down was gathered by Quigley and returned to the net with some force before the same player took advantage of a great Brendan Douban run to send over his second score before two minutes had passed. When Deaglan Foley made it 1-02 to no score seconds later, spectators could have been forgiven for believing a mis-match was about to unfold. Far from it as the Donegal champions settled impressively and reduced the deficit to a single point by the 13th minute with captain Henderson unerringly accurate from placed balls on his way to a first half tally of 0-08, including five frees and one ‘65’. Henderson grabbed MacCumhaill’s opening two scores before full forward Gilmore took an excellent catch, turned Malachy McCarron and fired over a lovely point for 1-03 to 0-03. Another Henderson free closed the gap further and after that opening salvo, it took 14 minutes before Na Magha troubled the score board again. Deaglan Foley got the Derry men moving once more and was impressive throughout though some second half wides did blot the half forward’s copy booked slightly. However, he was the one Na Magha player, along with Grant, who was carrying the fight to MacCumhaill’s. Whatever slight breeze there was probably favoured Na Magha in the opening half but they could never put any daylight between themselves and MacCumhaill’s who reeled them in to level by the 23rd minute through a lovely Gallagher point. From there to half-time, the Donegal men took control, Henderson with two points (1f) and Gallagher again from play leaving them 0-11 to 1-6 up at the interval. White picked up his first booking within a minute of the restart for a high stick to the head of Grant and Na Magha seemed to be have found their range as Foley (free) and a Brendan Douban brace brought it back to a one point game at 0-13 to 1-09 by the 41st minute. However, the crucial score of the game arrived within seconds of Douban’s second point and it came at the opposite end of the pitch. The restart found its way to Gilmore along the right hand side. The full forward showed good pace to get away from his marker before finding a brilliant low finish into the far corner. It was a hammer blow and stopped the Na Magha momentum in its tracks. From there, MacCumhaill’s managed the game impressively. There was hope for the Derry side as White went into the referee’s book for a second time in the 46th minute, this time somewhat harshly after catching Foley, but Na Magha could not make the extra man tell. Two points was as close as the Derry men could get in the closing stages with Henderson and Gallagher pivotal in keeping the Donegal side at arm’s length with crucial scores. Na Magha somewhat belatedly moved Grant forward from his deep sweeping position and he almost gave his side a lifeline in the closing moments when he forced Laverty into a great save. There was a suggestion of a foul on the Derry county player as he tried to shoot but with that chance went Na Magha’s last chance and it was fitting the game’s final score went to Henderson.